Upgrade your rabbit’s and guinea pig’s home with the range of Zippi Tunnels and Runs – now all with 10% off AND free delivery for a limited time only! This offer is available on ALL Zippi Tunnels, Playpens, Runs and accessories, so you can create your pet’s perfect play area and save 10% with free and fast delivery – just in time for spring! 10% off and free delivery promotion is only valid from 12/04/19 – midnight on 26/04/19. 10% off requires no promo code. For free delivery use promo code ZIPPISAVE. This offer is available on all Zippi tunnels, accessories, playpens and runs only. 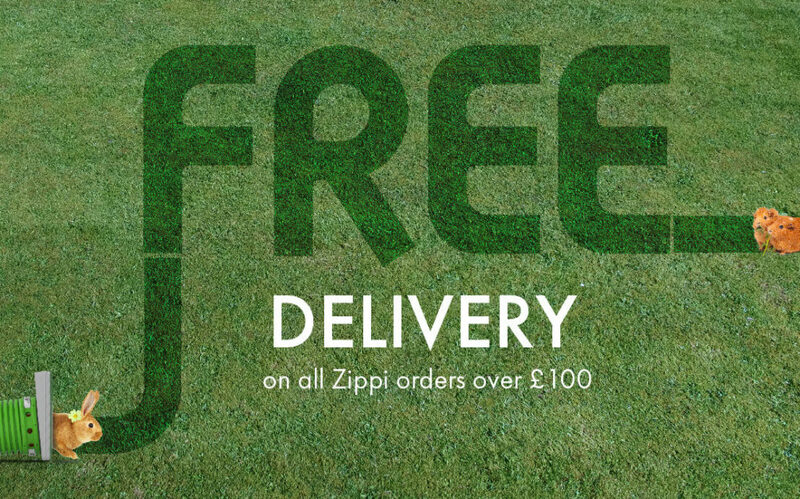 Free delivery applies to order containing Zippi products to the minimum order value of £100. Offer applies to Standard Delivery Service only. Free delivery offer is not redeemable on pallet deliveries. Omlet cannot take responsibility for third party supplier delays such as courier service. Free delivery is only valid for orders shipped to the United Kingdom, France, Germany, Belgium, The Netherlands, Luxembourg, Austria, Italy, Ireland, Norway, Poland, Denmark, Sweden and Spain. Subject to availability. Omlet ltd. reserves the right to withdraw the offer at any point. Offer is only valid on items from our Zippi range and cannot be used on existing discounts or in conjunction with any other offer. « Make a super yummy carrot cake this Easter!